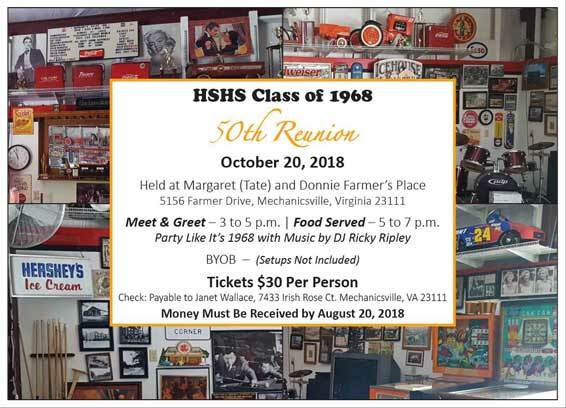 Meet & Greet – 3 to 5 p.m. | Food Served – 5 to 7 p.m.
Additionally, just so there is no misunderstanding, our 50th Reunion is for ’68 classmates and their significant others ONLY. If you would like to have your Reunion Information published on the Springer Connection, email webmaster@springerconnection.com. The Class of 1984 20-year Reunion was held the weekend of October 8-9, 2004. The BIG PARTY was held Saturday, October 9th at the Wyndham Hotel on Laburnum Avenue.. The next day, Sunday, a picnic was held at Dorey Park. Got any photos of this reunion? Send 'em in. Got a Report? Send it HERE or post it on the Message Board. The Class of 1963 40-year Reunion was held the weekend of October 10-12, 2003. Over a hundred were in attendance for a social on Friday night, as well as a picnic held on Saturday. The "real" Reunion held Saturday night brought out over 250 Springers and guests. More details and Photos are now on display in our Yearbook section. Got more photos of this reunion? Send 'em in. The Class of 1983 20-year Reunion was held Saturday, October 4th, 2003. Fill us in on the gathering and send us some photos for the Yearbook ! Send 'em in. The Class of 1973 30-year Reunion was held Saturday, July 26th, 2003. The Reunion was fantastic. Springers came from as far as the Sierra foothills of California, and as close as Sandston. Many in attendance had not been back in 30 years.